Our expertise of 50 years in Custom Molded Rubber, Custom Molded Silicone, Custom Molded Liquid Silicone Rubber (LSR), Custom Tooling made on site with tool steel (not temporary aluminum tooling). All of these point to your project of custom molded rubber and custom molded silicone with our years of experience leading to your project success in the most cost effective manner while being within budget, and on time. With our partners in China, we provide the fastest and most complete options for all your custom molded rubber and custom molded silicone projects. Compression molding is a process where heat is used to create rubber components for medical, industrial and automotive applications. During this process, the rubber material is placed into a mold cavity, the mold is closed, and held at a certain temperature, where it takes the shape of the mold. After cooling and trimming of any excess material, the end result matches any design you create. Compression molded rubber makes durable, intricate parts that can fit into a custom application or standard setup. Skilled production is key to this process, for the right mold design and using our ISO 9001:2015 process for excellent quality. By partnering with an experienced molder, this process can move quickly and speed up your overall manufacturing time. How is Compression Molding Different from Other Manufacturing Methods? • A high volume of silicone parts can be produced in a short time period. Our workforce is active 24 hours a day to make this process happen even faster. • Larger pieces can be made quickly using a customized mold that incorporates all of the features you want. • More intricate parts requiring multiple features and materials can be made quickly thanks to the custom mold we create. • Wide choice of polymers to make components with using this process, so the end result is a durable component suitable for use in automotive engines, industrial machinery and medical tools. • Less material waste than other types of manufacturing helps you save on waste and be a more eco-friendly consumer. The biggest advantage for many manufacturers is the ability to mold different textiles together during the process. Silicone can be molded to fiberglass, metal or other textiles to create a product with multiple finishes. Not only does this create a strong bond between the materials and keep the finished product from breaking apart easily, it eliminates the need to manufacture components separately and have them assembled after the fact. Not only does assembly cost you more, it takes more time and hassle to complete. Instead of having to seek out a new company to complete assembly for you, having the raw components sent to them and waiting for the assembly process to be completed, custom silicone compression molding gives you access to the finished product quickly. This allows you to bring a new offering to your consumer much faster, or solve existing problems with your manufacturing process without experiencing a significant delay in production. Why Partner With Rubber Industries? Applications of this style of custom molding range from simple belts to complex diaphragms with diameters of more than 10 inches. Rubber Industries can offer a variety of other molded rubber products through injection molding or transfer molding. Our expertise will help guide you through the design process to determine the best custom molded solution technology, material, and process to deliver your custom molded rubber and custom molded silicone parts on time and within your budget while maintaining the tight tolerances you expect for your automotive, medical, industrial, consumer and aerospace parts. Compression-molding is used by manufacturers in the industrial, automotive, aerospace, medical and consumer sectors to produce a dizzying variety of items made out of a wide range of durable and versatile materials. While higher durometer compounds can be used to make compression molded items, the process is best suited to materials with a Shore hardness rating of between 50A and 90A. RII can even make dual durometer components comprised of substances with different Shore harness ratings. EPDM: EPDM is a synthetic elastomer that is often used to make seals and other items that will be exposed to the elements due to its ability to withstand exposure to UV rays and ozone. Virtually all synthetic roofing membranes are made out of EPDM, and the substance is also used in water recycling and rainwater capture systems because it does not contaminate the fluids it comes into contact with. Butyl: Butyl is chosen by manufacturers looking for chemically inert compounds that are durable and resistant to gasses. Automotive uses for butyl include the inner linings of car tires and components like O-rings that are used to dampen vibrations. It is also used to make pond liners and air hoses, and medical companies often choose the substance for medicine bottle stoppers. FKM: Fluroelastomer is used for products that will be required to endure chemicals, oil and very high temperatures. Car makers use the substance for turbocharger system components, gasketsand seals, and FKM is also used widely in the chemical manufacturing industry for items ranging from bellows and roller covers to expansion joints. Viton: Viton is a type of FKM developed by DuPont in the 1950s to meet the needs and unique demands of the growing aerospace sector, but it is now used by consumer and industrial manufacturers due to its high performance, durability and flame resistance. Viton is the favored compound for biodiesel lines due to the fuel’s high acid levels, and it is often used to make chemical resistant float valves and O-rings for use in petroleum refineries. Nitrile: Nitrile is an economical alternative to natural materials when resistance to heat and oil are important. It is suitable for making overmolded items, and nitrile NBR to metal bonded components are used widely in automobile and aircraft fuel and cooling systems. HNBR: HNBR is another durable and reliable synthetic compound that is widely used by industrial and consumer manufacturers. It can withstand temperatures as high as 165 degrees Celsius for prolonged periods without degrading, but it is vulnerable to certain organic solvents and is not flame resistant. It is commonly used to make timing belts, roller coverings and hoses. SBR: Derived from styrene and butadiene, SBR is a rugged material that is used to make about half of the world’s car tires. It was developed by German chemists in the 1920s to provide industry with a safe and inexpensive alternative to natural compounds. The substance resists abrasion and is an excellent choice for rubber to metal bonded items. Neoprene: Neoprene polychloroprene is a durable multipurpose elastomer that manufacturers have been using for more than 75 years. It is flame resistant, can withstand sunlight, and can tolerate exposure to chemicals, oil and high temperatures. Neoprene is often chosen for CVJ boots, vibration mounts, diaphragms, gaskets, washers and bearing pads. Silicone: Silicone compounds are used when components will be exposed to extreme conditions. It can withstand temperatures as high as 250 degrees Celsius and as low as minus 100 degrees Celsius. It is often molded into oven door gaskets, shaft sealing rings and automotive driveshaft components, and its excellent insulating properties make the substance a natural choice for electrical safety covers and wire and cable jacketing. We have partnered the best rubber parts molders in China. Our tools and process have been implemented to allow for larger volumes. Compression molding is a process where heat is used to create rubber components for medical, industrial and automotive applications. During this process, the rubber material is injected into a mold cavity and heated, where it takes the shape of the mold. After cooling and trimming of any excess material, the end result matches any design you create. Compression molded rubber makes durable, intricate parts that can fit into any custom application or standard setup. Skilled production is key to this process, as heat compression relies on the operator to create the right mold and keep the temperature during the process stable. By partnering with an experienced provider, this process can move quickly and speed up your overall manufacturing time. It takes expertise to produce quality products using a compression mold. The heat level has to be kept uniform to make things at a high volume and have them turn out to be sturdy and resistant to damage. At Rubber Industries, our years of experience with rubber and silicone compression molding helps to benefit every customer. We can help guide you through the process of using compression molded rubber and silicone to create any products you need. With our manufacturing partners throughout Asia, we can create a cost effective mold to make production move quickly and ensure an accurate result. Contact us to find out more. The compression molding process was originally developed by the plastics industry and continues to be a common way to produce durable rubber and silicone-based molded products. It’s a basic process compared to injection molding or transfer molding and is suitable for medium or low volume production of medium or large items. During the process, pre-forms made out of silicone or synthetic compounds about the same size as the finished item are inserted into a mold cavity where they are cured or vulcanized by a combination of heat and pressure. Breakfast waffles are made in essentially the same way. Compression molding can be used to produce items made out of a wide variety of materials including some of the more exotic and expensive synthetic rubber compounds. It is especially suitable for high durometer materials used to make extremely hard items. In addition to seals, O-rings, diaphragms and bellows, compression molding can be used to make intricate components due to the flexibility of the process. Compression molds contain from one to hundreds of cavities, and multiple mold plates can be used to produce complex parts. Experience: While compression-molding can produce high quality and long-lasting components, the production process requires technicians with skill, detailed process knowledge, ISO 9001:2015 process certifications, along with a deft touch as precise temperatures repeatable work processes must be maintained throughout. The experienced production supervisors at RII have years of compression-molding experience as well as our 50 years of working with every imaginable rubber and silicone compound. They also work in a state-of-the-art facility equipped with multiple modern injection presses to meet your specific project and a cryogenic de-flashing system. In-house chemistry and engineering: RII's team of chemistry experts and manufacturing experts have spent decades formulating compounds for the most demanding applications and are experts at creating materials suitable for all overmolded parts, including NBR to metal bonded and EPDM to metal bonded products. We can formulate materials in a variety of custom colors or produce compounds that will be used to make optically clear items. Our chemists also work alongside our production staff at our vast Minnesota facility and partner so that the production of your parts are on time, and in budget. Custom molded parts made using the compression method may not offer the precision of components produced by injection molding or transfer molding, but they are consistent enough for some very demanding applications. Compression-molded parts are also fast and quite economical to produce. The process is made up of the following steps. Pre-form insertion: The first step of the process is to place a piece of uncured compound known as a pre-form into the mold. The pre-form is cut to the approximate size of the finished item. Compression molds generally consist of a top and bottom plate with half of the cavity cut into each plate, but three or more plates may be used to produce complex items. Compression: Once the pre-form has been put into place, the mold is heated to a temperature appropriate for the compound and closed. The weight of preform used must exceed the weight of the finished item to ensure that every crevice of the mold is filled and any air is forced out. Using too little pre-form could result in air bubbles or voids in the finished item. A trim area made up of what are known as flash grooves is cut into the mold around the cavity to allow excess compound to flow out. Curing: The compound is then cured by a combination of pressure and heat. The curing time will be dictated by the specific formulation of the compound being used. The curing process, which is also referred to as vulcanization, generally takes between 5 and 15 minutes to complete. Once the optimal cure has been reached, the part is removed or ejected from the mold cavity in an operation known as demolding. It is then allowed to cool and harden. Deflashing: After it has cooled and hardened, the custom molded item undergoes its finishing procedure. 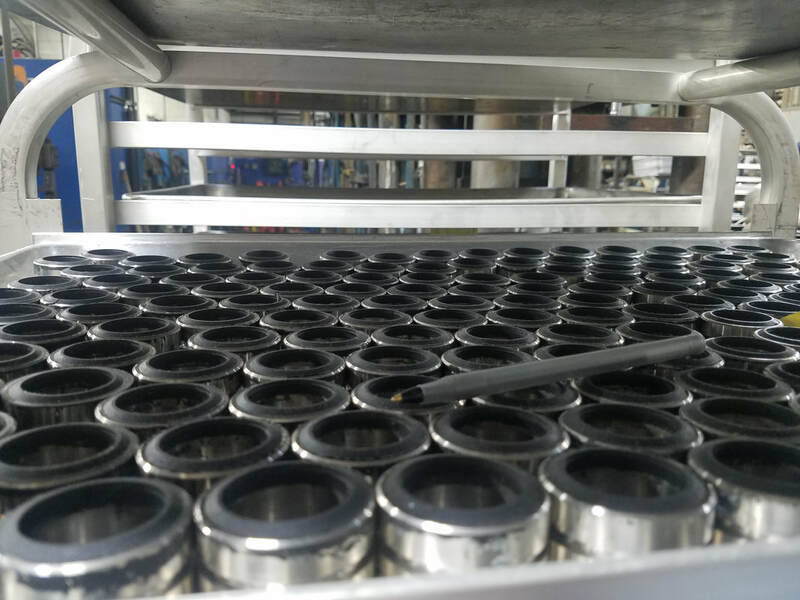 This usually involves a certain amount of deflashing to remove excess material and may entail additional curing steps, an automated or manual inspection procedure and packaging. Technology: RII invests in the latest and most efficient manufacturing machinery including a sophisticated cryogenic de-flashing system. This technology uses liquid nitrogen and a series of small tumbling beads to remove parting line flash from even the most difficult to reach areas of complex compression molds. This speeds up production, improves consistency and saves our clients both time and money. Our huge Minnesota production facility is also equipped with multiple modern injection presses to meet your specific project requirements. Inexpensive and fast tooling: RII can sometimes produce custom tooling for compression molds in just a few hours, and even complex tooling can be completed in a matter of days. We also make our tools out of durable steel instead of aluminum for improved component consistency. Fast turnaround: Speedy tooling leads to faster prototyping and shorter lead times. RII offers the fastest prototyping services in the industry, and our rapid turnaround times and ability to meet deadlines are among the reasons why Fortune 500 companies including Ford, General Electric and DuPont are some of our most loyal customers. Our three factory shifts provide 24 hour production to ensure that orders are filled quickly and shipped out on time. High cavity counts: Compression molds can have dozens or even hundreds of cavities, which is why the process is suitable for intricate components with multiple features such as inserts. RII has made custom compression molds with as many as 750 cavities. A wide choice of materials to choose from: The process is able to handle most of the elastomers used in modern manufacturing and can be used to produce items in custom colors. It is also suitable for making both high durometer and dual durometer components. 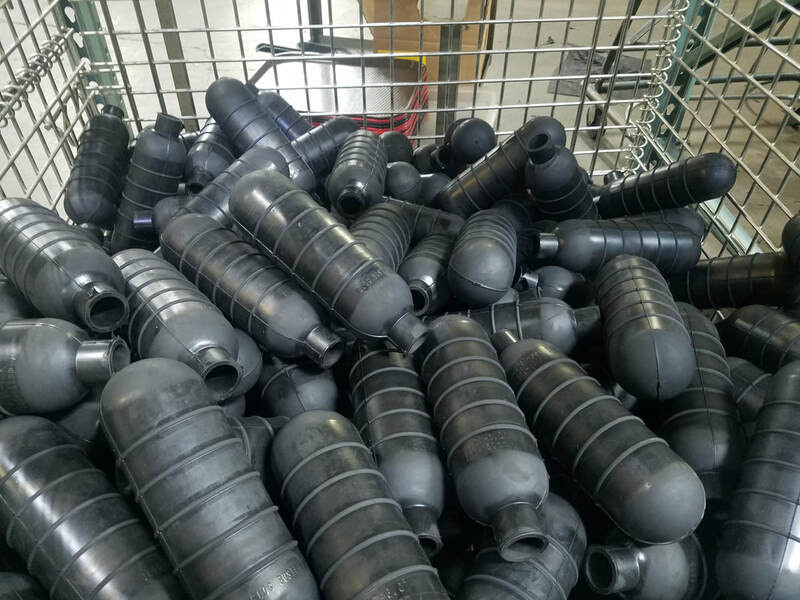 Less waste: Wasted materials are one of the few drawbacks of custom injection molding, but this is not a problem with compression molded items. RII’s lean manufacturing processes and computer-controlled presses reduce waste further to save our clients even more money. Innovation: Experience and innovation allow RII to produce certain rubber to metal bonded and Nitrile NBR to metal bonded items using the compression method. 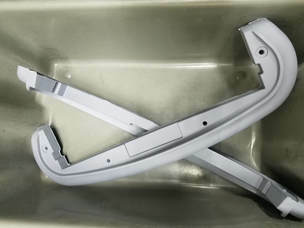 This type of component is usually made using more sophisticated and expensive high volume injection molding techniques. While compression molded items are generally made in medium or low volume production runs, RII’s economies of scale may make the process suitable for larger orders that must be filled quickly. Less than perfect precision: The compression process can produce intricate and complex items and it’s the fastest method to get large quantities of parts fast and economically, but the levels of precision and consistency attainable with pre-forms do not match the results achieved with the liquid injection method. Labor intensive: The labor intensive nature of compression-molding are the main reason that the process is rarely used to fill high volume orders. Placing pre-forms into mold cavities takes longer than injecting liquid compounds into closed molds, and finishing steps like deflashing are more involved and time-consuming. Our Minnesota campus: Even complex overmolded items can be manufactured quickly at our state-of-the-art facility because we have our design, chemistry, prototyping, engineering and manufacturing departments all under one roof. Fortune 500 clients turn to RII when they have custom molding jobs because they know that they will receive a finished product and not a collection of components that require assembly or further work before they can be used. Our scaled, high volume, production capacity: RII has entered into and nurtured relationships with some of Asia’s largest and most experienced manufacturers. This means that we are able to satisfy even extremely high volume orders for precision molded components. Our Asian partners work with our Minnesota-based chemists, engineers and technical experts to make sure that orders are filled quickly and molded items meet specific client requirements. Our prices: Investing in new technology, automating production and concentrating our operations under one roof allows us to offer extremely competitive prices while maintaining the highest levels of quality and precision. We also help our clients to avoid ruinously expensive delays by delivering components quickly so their projects stay on track. Our customer service: RII offers quick high volume capability with injection molding to businesses of all sizes, and we give small business owners the same great service we offer to Fortune 500 companies. We work around the clock to meet the needs of the global marketplace, and all of our departments work in the same building to improve communication and ensure that client questions are answered promptly.